Sigh … a corner in my fledgling garden, planted only 10 months ago, is taking some serious strain this week. First of all we had the Arborist and his team here on Monday. What can I say other than that I now have plenty of sun light coming into the garden. I do hate how sparse everything looks right now, but it needed to be done, what with a neighbour threatening me with lawyers letters because berries off my trees were blocking his pool filter and a general clean up needed anyway, we went the whole hog and they did a mass clean up. I have to compliment this team of tree fellers though – they did extensive work and were busy in every single garden area – I begged them to be careful with my plants and … they were! Only one little plant lost a side branch. How’s that for care? They worked fast and well and I was very impressed with them. I expected lots of trampled plants and all I could find was one minor thing that can’t even be considered a “plant casualty”. More like a light pruning. Whilst their work was outstanding, I do prefer full lush trees and hate the bare look and all the walls and neighbour roofs I can see now! But so be it. But then on to the news story of my week. In my back garden we have this one very deep shade area that always seemed to me as if something was not quite right. Nothing grew particularly well (which I assumed was because of the shade) and it had a weird vibe about it. I can’t think of any other word to describe it other than “miff”. This is also the area where Willem (the Arborist) removed a tree that was growing into my bedroom windows and damaging foundation walls and I thought that might fix things. Then the rain came down and we discovered that we had some seriously blocked drains there. No drainage – something very blocked – almost like a quagmire back there. Enter the Plumber. 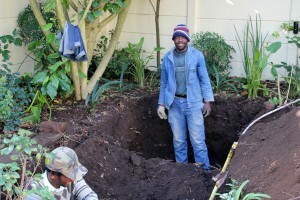 Apparently a “French Drain” that lives underground, is totally blocked and needs to be dug up and enlarged so that the water can drain away properly. Result: One huge mess. Absolutely all the plants in that area have been dug up, there are huge piles of stone and soil and … well I am just not going to look at it again until they have finished the job or I am going to cry. And the worst thing is they won’t finish it today, it will take Monday as well, so I can’t even “fix” it this weekend. I clearly will have to reaccess, redesign, replant and re-love that whole corner area once they finish. So I started this post with a sigh and I end it with … another huge sigh! Can’t see. The berry tree? Is that our Australian brush cherry? Which you’ve had cut back? It is a bit like the South African version of Britain’s leylandii monster! Hi Diana – Yes, they are Syzygium sp. (Eugenia) – I looked them up and the common name seems to be Australian brush cherry. I’m really not a big fan of these trees. It’s so prolific and becomes an issue every 6-9 months with the neighbours and it casts dense shade in the garden. Awww Christine….sounds like you are having a trying time of it. But, looking on the bright side, you can redesign that corner once all the drain work has finished. That’s something to look forward to. And as Holley said, there’s nothing like a spot of retail therapy to cheer a girl up. You sound like you have awful neighbors like mine. Their latest achievement is a bright shiny silver chain link fence running the entire length of my two acres. I had a similar drainage issue last year and my whole terrace was dug up. I tried not to look and when it was all put back together it really wasn’t that bad. Take heart! Oh no, the bright shiny chain link fence would really irk me! Thats actually worse than threats of lawyers. Oh dear! I know that feeling when devastation and destruction falls upon your garden. Just remember it heals quickly and the garden is always better off afterwards. 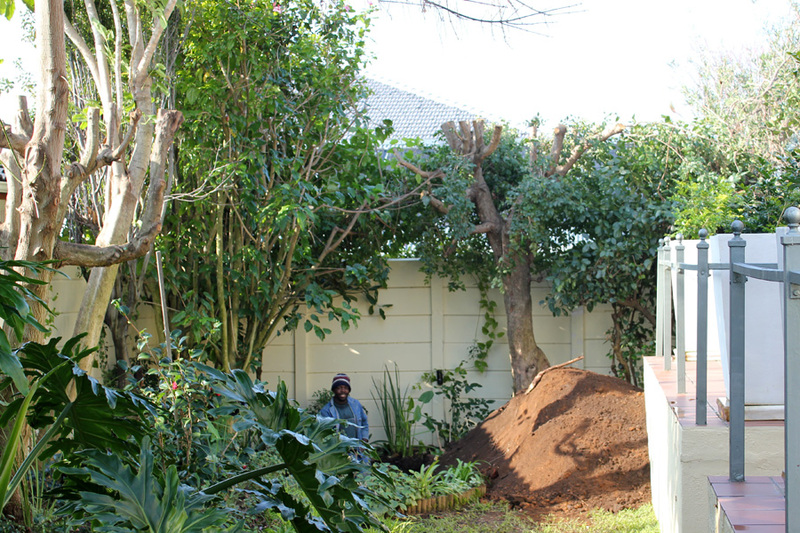 That area of your garden wasn’t your favorite and maybe it will bring new life and joy when all is finished next week! See it now as temporary!! Just go shopping!! hehe, yes – I have a really good reason now to go shopping! Go plant shopping this weekend – that’ll get you away from staring at it, and mentally positive about the future of that area. (I use any excuse!) Anyway, sorry about your garden, but at least you are getting it fixed, and now the plants will be happy! No more weird vibe! Hi Christine, Your experience seems pretty trying especially since it sounds as if you just planted this area and I’m sure you spent time picking out certain plants that would be perfect for that spot. But, it must be a huge relief to have everything calm down with the neighbors. Will the plants in the area be fine wo the tree for shade? As for the other area, my experience with old homes is (not sure if yours is but probably since trees are so well established) many times one thing leads to another – a simple projects turns into a much bigger one. But that is the way it is with established areas and I still believe they offer something new homes/gardens just can’t compete with. I know you will do a wonderful job “fixing” it and have lots of healthier plants to look forward to! We are trying to save the plants … and yes, I will be buying new things to add here. I just wish they were finished so I could access what to do! Christine, before you know it the soil will be returned, you’ll put some more plants in — maybe rearranging or adding something new — and the dig will be a distant memory. We did the same thing a few years back, removing 5 huge trees and leaving a “disaster area”. It’s a hundred times better now. Sounds like you had a fantastic tree team too! I hope you recommend them to *everybody*.